Glam Bronze Eau de Soleil. A formulation so light that it smooths perfectly over skin building up to a flawless bronzed look, without the heavy feel of powders. Use under your foundation to create a bronzed base, or under your cheekbones and around the edge of your face to contour. The weightless, lighter than water formula is enriched with gold micro pigments to add the most natural, light reflecting bronze touch for luminous looking skin. Unfortunately I did not like this product at all. I found it to be too watery and struggled to apply it with great results. I did not try this under make-up and perhaps I should have to give it a fair testing. However, I was so put off by the fact the liquid ran out of the bottle and down my sink super fast. The liquid was simply just that and for me, I prefer a more creamy or gel texture that absorbs well into the skin. 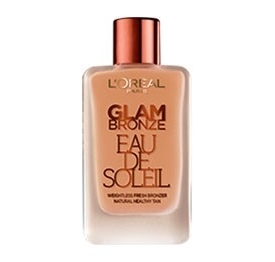 I am sure other users will love this bronzer from L'Oreal, but for me it failed to impress. A little will suffice to give a healthy glow with or without make-up. "Unfortunately I did not like this product at all. I found it to be too watery and struggled to apply it with great results. I..."